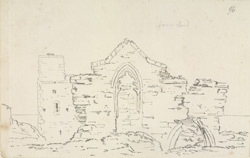 A view in ink of part of the ruins of St Cuthbert's chapel on House Island or Inner Farne Island, off the Northumberland coast. The chapel was built between 1369 and 1372 by a small group of Benedictine hermits. After Henry VIII's dissolution of monastic houses, it became a lighthouse keeper's cottage, but had fallen into ruin by the time Grimm made his drawing. It was partially restored in the 1850s by Archdeacon Thorpe of Durham, who used some 17th-century furnishings from Durham Cathedral itself.